Too good to be true, Scott Keltner. So is it … free … then? I give this image strong odds on provoking a class debate and highlighting some of your students’ misconceptions of percent growth. Car Chase, Ryan Brown. The current darling of 101questions. (12 questions, no skips, as of this writing.) Notice how the first car smacks into the second, which was hidden off-screen. That’s stylish camera work! Muggsy Bogues, Tony Gumbo. The question, “How much shorter is Muggsy Bogues?” is one thing. “How many different ways can you express that difference?” is another. (eg. Absolute v. relative.) Start with the first. End with the second. First day of school, John Golden. “Is your height linear?” It’s a striking visual and the units along the “x-axis” are identical so you have a rare moment to examine the growth of height over time using people in photographs rather than points on a graph. Speaking of obsessives, Andrew Stadel has written a great tutorial for getting the most out of 101questions. Veggie Juice swings for the fences. You decide where it lands. Closing. Timon Piccini’s Cab Ride is the first first act to “close,” which means 100 people responded to it. Now it goes to the very bottom of the pile on the homepage, where it’ll only be seen once people have seen everything else. Initially, I thought first acts would close in a matter of hours after being uploaded. That was naive. It took months. Edmonton Water Consumption, uploaded on a dare from Sean Geraghty. My assumption is it’s going to get clobbered. At this point, I’ve posted about 300 questions. I’ve noticed that I’ve kind of changed my approach for coming up with questions for other people’s items. Rather than try to guess the question that fits as math teacher, I’m trying to put myself in the shoes of a 9th grader and decide “will they find this perplexing”? Fuzzy pictures: skip. Small font items like receipts and print advertisements that are full of numbers and words but no overtly visual content: skip. I’m also noticing that I’m beginning to skip items that are repeats of previously seen items – even just same genre items like super large ________. Initially, the questions were leaping right out at me. But now I feel like the student who says “oh, we’re doing this again.” No longer perplexed if I know what the teacher wants me to say. (Full disclosure: 2 of my 7 uploads are “world’s largest ______” related). Am I too harsh here, or are other people taking a similar approach? I’m also finding a difference between “perplexing” and “interesting”. There’s a ton of stuff out there that is very cool and very interesting (intricate artwork, geometric designs, etc), but there is no obvious solvable mathematical question that is just begging to be asked. I skip those every time. Why is it that your always-smart content makes me feel so stupid? My 9-year-old and I tackled the 70/30 pic. He loved it and quickly shared it with his mother, when he figured it out. That car chase is really nice. There wasn’t as obvious a question with the lawn mower, but that was just exploding with really great questions. Motion in a non-linear path seems ripe for the picking. There are several entries that I found interesting, but not mathematically interesting. And there were many that triggered a mathematical question, but not one I cared about. It is really difficult to think of things like the car chase that do both. I think weeding (I’d prefer pruning, or refining) the entries is the *point* of 101qs. This is where people who don’t have Dan’s Twitter-reach can put their current best draft in front of an audience, get some feedback and make it better. While I’ve used a few of the current examples with students, those have always been exceptional cases where the media product overlapped some curricular project or student interest. 101qs can strive to be the modern incarnation of that blank wall above the faculty room copier, a space for ideas that spark conversations and reflection, with a very low barrier to entry. Dan, is there any way to do a top 10 (or 5, whatever)….of just the last 30 days?. The top 10 first acts can be tough to crack, and it would be nice to see a more evolving list. Now that there are some many first acts, I have had students start with the Top 10 to get a feel for the “best” before I set them loose exploring all of the acts. With Plinko, if the $10000 was in a different spot, the player could just move their chip and drop it directly above the new location. But the real reason to put the $10000 in the middle is symmetry: it lets them place two $0 spots on either side and nobody feels like it’s unfair. Stopping the video there is nice, although it might be too soon: it’s far enough up the board that you can’t see the dollar amounts, and it’s also far enough up that computing the probability is challenging without knowledge of combinations / Pascal’s Triangle. The 70/30 problem has a lot of “legs”, so here’s an extension: if the company wanted to make it look like 100% total discount but still make the product as expensive as possible, what should they do? 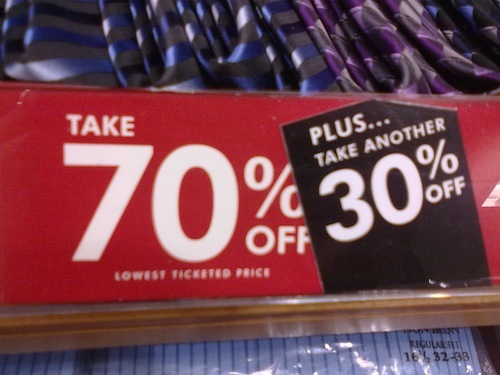 What if they could split the discount more than twice? Is there a way they could make it look like 100% total discount while keeping the actual discount less than 50%? I really love these Five Favorites posts. As I watched “Veggie Juice”, it occurred to me that 101qs.com might be improving participating teachers’ presentation abilities quite a bit. It takes a good, critical eye to turn an idea into something presentable, and it takes a lot of looking at/comparing examples to develop that eye. Maybe I’m only letting myself see/remember the good examples…but it feels like there are more good examples than before. I used the Plinko problem in my classroom today. Follow the link to see how I went about it. Anyway, I agree that the video would’ve been better if it included the dollar values, but I don’t feel as if that’s much of a problem because the kids have seen the game run through the first time. And I found that the kids were only thinking about one dollar amount — the $10,000 slot. Meaning, they weren’t even thinking about the $100 slots off to the side. It was a little drudgy, but kids did OK calculating the probability. I gave them a simplified Plinko board that avoided bouncing off the side walls. I hope to use the Plinko board, along with a few other problems, to motivate and give context for Pascal’s Triangle. Suggestion for further work with your kids: have them work on expansions like (L + R)^n, working up to (L + R)^5. Then see if they can explain the connection between the L’s and R’s, the Plinko game, and the probability the students found. A site where your photo or video only finds purchase on the main floor if it meets the approval of a small group of moderators isn’t all that interesting to me. Dan, is there any way to do a top 10 (or 5, whatever)….of just the last 30 days?. The top 10 first acts can be tough to crack, and it would be nice to see a more evolving list. Hello! I am a pre-service teacher from the University of Regina(math major, chem minor)! I have just subscribed to your blog and look forward to developing through following your blog! I think I have another interesting way to test out how perplexing these videos and pictures are. I’m going to take items from 101qs, and let students decide which ones they would be most motivated to solve (I would have to give them the most often asked question for each item). I could probably do a yes/no vote for each item and create a new perplexity score. I wonder how each item would rank under this kind of system? I might do this at the end of next week. Anyone have any suggestions for how to run this experiment? That’s a great idea… I was thinking about the same thing… cuz you know what we think is perplexing might not be to them! Maybe number them, give them a numbered list with the titles with a scale from 1 to 10 and have them circle a score? You’d have to tally the data though. Bingo. I look at the items I’m posting that have the lowest scores and clearly people are not seeing the question that was in my head. I’m bummed at first, but I think this is great feedback to receive. It’s one thing to declare “a system that grades ME at MY current level of understanding.” It’s another to figure out what that system would look like in practice, and in code, how it would differentiate those users, how it would allow for their transition from one tier to the other, et cetera, et cetera. Gotta think these things through, seriously you guys. But the next rev of 101questions includes the option for users to delete their own first acts. So you can feel free to delete anything you aren’t proud of and voila your perplexity score will be looking good again. Nothing to say here. Just thought it deserved highlighting. This is all such great stuff. And it’s interesting how concepts have evolved and we have moved one from them, but we still need to respect the new folk, and welcome the submissions of people who are new to the party. Sure, we might get tired of seeing “oh, another really over-sized thing” on the site, but put yourself in the shoes of someone new to the site. Let them experience the same “wow…cool” moment we all had here at some point. I have appreciated the chance to scan my personal memory banks of neat stuff and lessons I have used in my teaching career, and try to bring them here in visual form. It’s never a good idea to stifle the creativity of others. Something new to you may be that “aha!” moment to somebody else.